Did I miss something? Was it that big a mystery that Olivia returned to Oyster Bay? She left then she came back. People do it all the time. I'm still not sure if I like Olivia. I like how independent she is and how much of a problem solver she is. I'm not a fan of the fact that she takes her dog everywhere, especially into restaurants. There are two potential suitors, one of which I could have sworn had something to do with all the mess that had been happening in town. I like the supporting characters. They have enough personality to counteract Olivia's personality. 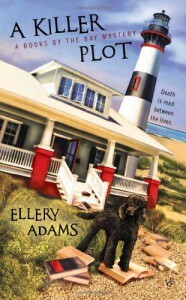 I really enjoy Ellery Adams writing style and her books. I have put her in the "slow roll" category when it comes to her books. I usually have to sit on them for a few days to let everything sink in. I tend to find that despite any gripes I have with specifics in her books, I will always come back to them.